How does Tallyfy compare to BPM, project and task management tools? To run reliable and scalable operations – you need processes, not projects and tasks. Good for grocery lists. Bad for operations. Since every project is unique and different – you keep re-inventing the wheel. “Let’s do it better next time” keeps getting forgotten, every time. Impossible to collect structured information. Thousands of comments. Files scattered everywhere. It’s impossible to collect information in a predictable and structured format. If exploding stress from email overload was bad – try chat. It’s the same stress – in real-time. 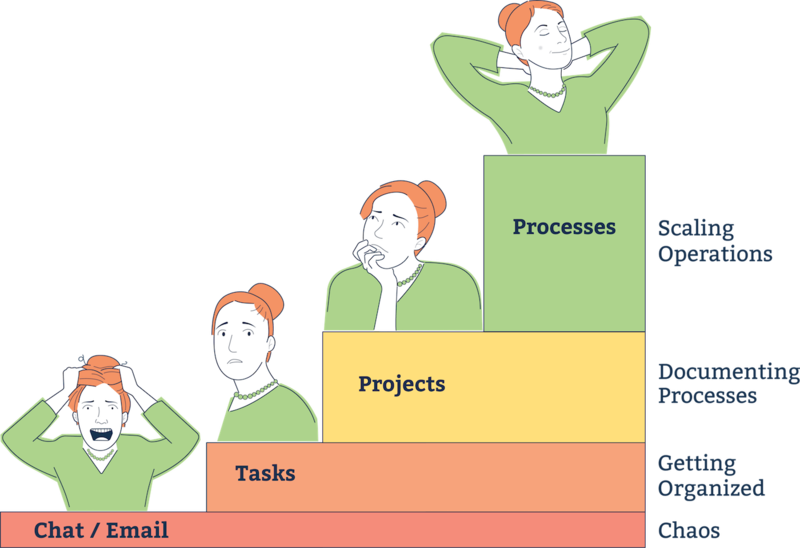 Surviving with email and chat is not process management. 60 replies. 70 unread messages. You have no idea what’s important and what’s not. Blink and you might miss something. You’re addicted to checking your chats. What’s an action and what isn’t? How do you know the difference between a task, approval or action in a mess of conversation and noise? You hope that someone actually looked at the flowchart. Mapping a process is not the same as running a process. Don’t worry – you can use flowcharts/BPMN WITH Tallyfy! Great to map a visual. Useless in real-life. Does anyone actually look at a flowchart while they are working? Real-life is never a neat arrangement of boxes, shapes and arrows. Flowcharts don’t even fit on a phone screen. Impossible to track or improve operations. Since your flowchart is impossible to track or follow between people – how will you know it’s working or not? Old-fashioned “Business Process Management” is even more complex and expensive than it sounds. A painful waste of IT and consulting time. With old-fashioned BPM – you have to model processes in BPMN and then apply them to real-life. Say hello to a 6-month IT project with a consultant army – for an outcome that doesn’t work. It’s about IT automation – not growth. You could never invite a client to do a task on a traditional BPM. With Tallyfy, you can involve clients in workflows through secure and beautifully easy guest experiences that add to your bottom-line. Build systems. Scale your operations. Tallyfy is the world’s first and best-designed process tool designed to bring the power of repeatable processes to anyone. You don’t need coding skills or fancy qualifications. Tallyfy helps you scale your business and even sell it – by systemizing how it runs. Tallyfy » How is Tallyfy different to task, project and chat tools?